This entry was posted in Holiday, Home Security and tagged Home Security Systems, Home Security Tips, Theft Prevention, Tips and Tricks on October 9, 2017 by Locksmith Sarasota. Halloween is only a few weeks away, and it’s important to take time to safeguard your home before the holiday season is in full swing. Burglaries and home thefts are more prevalent during the holiday season, and preparing ahead of time can minimize the chances of your home becoming a target. Most burglars take time to “case” homes before striking. “Casing” refers to watching target homes to see what kind of security the homeowners have, what times the house is empty, and other variables. Burglars will look for the least secure homes that offer the greatest chance of success. 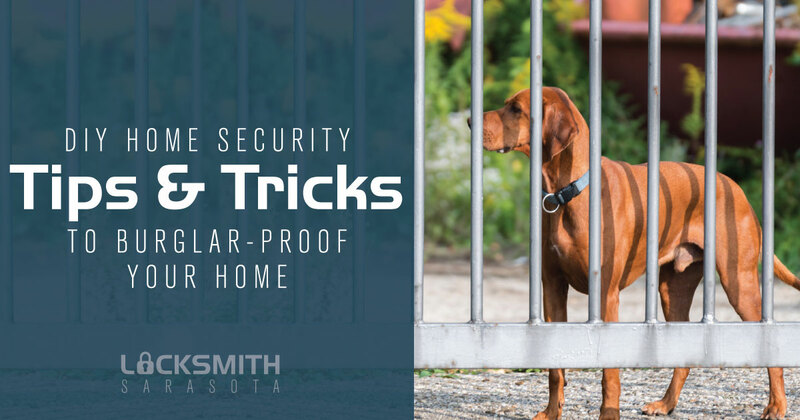 Home security: More often than not, having a home security placard on your lawn, or visible security cameras on your property, is enough to deter most burglars from even bothering with your home. Roughly 90 percent of convicted burglars report they would avoid a home that has an alarm system. Homeowner presence: Vacations and long-term travel are when your home is most vulnerable. Burglars will look for piled-up newspapers and overgrown lawns to indicate which homes have been empty the longest. Cover: Burglars tend to avoid homes with lots of open, visible space around them. They prefer homes surrounded by lots of foliage that can offer cover while moving around the home to allow them to hide from prying neighbors’ eyes. Dogs: A burglar typically will not try to enter a home with a barking dog inside. If you own a dog that stays home while you’re at work, your pet may be a better security asset than you ever realized. Dogs will also alert their owners to intruders who attempt to enter at night. If you don’t own an alarm system or security cameras, you can still trick would-be burglars into thinking you do. Consider placing a fake alarm system placard in front of your home if a real alarm or security system isn’t in your budget. Some burglars will write off your house immediately. This trick probably won’t work on more experienced, tech-savvy burglars, though. You can purchase a simple home security camera system at relatively low cost. Do some research into the most reliable and affordable brands and look for tips on where and how to your cameras. It’s important for your cameras to be somewhat visible, so would-be burglars notice them, but you also need to place them in spots that offer wide fields of view. Keep the previous tip in mind if a security camera isn’t in your budget. A fake camera may serve as a somewhat reliable alternative to a real one for some houses. Some thieves won’t bother trying to enter your home and will instead steal items from your yard, porch or garden. If you plan on taking a long trip, bring these items into your garage or another storage area while you’re away. Refrain from leaving gardening tools or items like ladders outside that a burglar could potentially use to gain entry to your home. You can purchase timers for your outdoor lights, and may even want to consider putting some indoor lights on timers, especially if you plan on taking a long vacation. Light timers will automatically turn your home’s lights on and off at specific times. 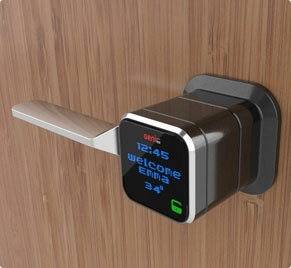 This can make it appear as though you are home while you’re away, thus making your home less of a target. Many thieves follow delivery trucks around to look for packages to steal in the weeks leading up to the winter holidays. Millions of people have their packages stolen each year in the U.S.
You can opt for sign-on-delivery security for some packages. For expensive items, it may be best to arrange delivery to your local post office so you can pick them up securely. Consider investing in a more reliable security system this holiday season. Locksmith Sarasota offers a variety of state-of-the-art and affordable home security options, including high-security door locks, alarm systems and much more. When you inquire about our home security lock services, we’ll review your home’s vulnerabilities and help you choose the right security equipment to protect your home and loved ones, where and when you need it most. I’m the owner of Locksmith Sarasota. My company provides full mobile local locksmith service all over the Sarasota area. We always offer reliable and professional service with fair prices and a friendly attitude. Whenever you need a local locksmith in Sarasota, please give us a call and me or one of my technicians are going to be there for you. We are happy to provide a 10% senior and military discount. We are glad to provide financial assistance to those who may need it as well. We are always ready to help our community. Backed with our many years of experience in serving the city, you can rest assured that you are in good hands. Call us for the best locksmith service in Sarasota! Have you experience being locked out of your car? Sure, this is embarrassing, but worse is that you cannot get into your car and drive where you need to be. We are help to help you out. Locksmith Sarasota is the best way at opening your car or truck without having to break the window. Did you lose your car key? Misplaced it perhaps and couldn’t find it? We are fully equipped and capable of making dealer car keys, transponder keys, laser cut keys, remote head keys, and chip keys. Did you forget the keys on your house? Are locked out for your home? Regardless of the time of the day and night, we can get to you to help you get inside your house. Also, we offer new door locks installation to ensure that the safety and security of your property and family are protected against burglars and other intruders. Have you transferred to a new office in Sarasota? Do you want to make sure that your commercial business establishment is secured? Call Locksmith Sarasota and we will install new locks to your office to ensure that no one can enter your property without your permission. As a family owned company, we are flexible at our pricing. We are licensed, bonded, and insured and have had worked with a number of clients in the greater area of Sarasota FL. Contact us for all your locksmith service needs and we will gladly attend to your needs our best ways possible. Need an Affordable and Reliable Locksmith?